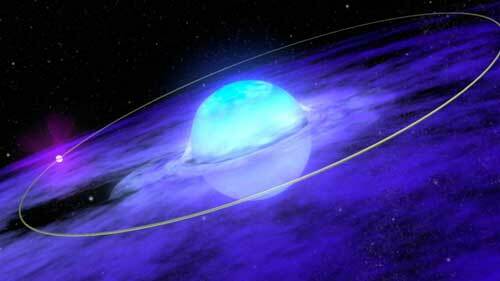 (Nanowerk News) A wobbling disk of matter could be responsible for the gigantic x-ray bursts that occasionally flood from a distant binary star system, according to calculations by RIKEN researchers (Astronomy & Astrophysics, "Possible regular phenomena in EXO 2030+375"). The team studied a binary star system consisting of a neutron star—a small and incredibly dense star—and a Be star—a hot, rapidly rotating star that is throwing off a swirling disk of matter. The two stars move around each other in elliptical orbits (Fig. 1). But the binary system has also emitted two much larger x-ray outbursts—one in 1985, when it was first discovered, and another in 2006. The cause of these massive outbursts is unknown. Eva Laplace and Tatehiro Mihara of the RIKEN Global Research Cluster and colleagues thought these giant outbursts might be linked to two other mysterious occurrences. In 1995, the regular outbursts started to arrive 8 or 9 days earlier than expected, a change known as an orbital phase shift. But after the 2006 giant outburst, they returned to their original schedule. Moreover, the neutron star spins on its axis every 42 seconds or so, but it sped up slightly after the 2006 giant outburst, and very recently started to slow down. Using observations from several telescopes, including the Monitor of All-sky X-ray Image (MAXI) on the International Space Station, the researchers compared various factors including the binary’s x-ray emissions, the timing of the regular outbursts, the neutron star’s spin, and the size of the Be star’s disk. Their calculations suggest that the giant outbursts are themselves part of a periodic cycle, and might arise because the neutron star’s gravity warps the Be star’s disk, either elongating it into a more elliptical shape or forcing it out of the plane of the two stars’ orbits. “When this happens, the neutron star can pass through the disk and capture sufficient matter to produce a giant outburst,” explains Mihara. The team predicted that the next orbital phase shift should occur in December 2016. In fact, astronomers saw an orbital phase shift in July 2016, just as the researchers submitted their results for publication. This five-month timing difference may be due to uncertainties in their calculations. The team now plans to study the binary’s optical and infrared emissions to verify whether the disk is indeed more elliptical or inclined than usual.